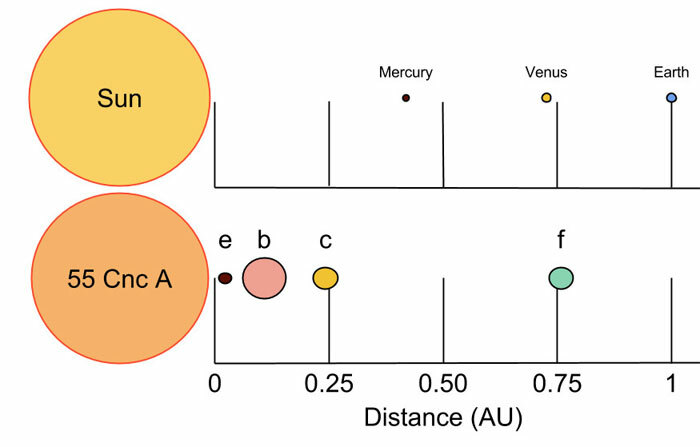 An illustration of the orbital distances and relative sizes of the four innermost planets known to orbit the star 55 Cancri A (bottom) in comparison with planets in our own inner solar system (top). Both Jupiter and the Jupiter-mass planet 55 Cancri "d" are outside this picture, orbiting their host star with a distance of nearly 5 astronomical units (AU), where one AU is equal to the average distance between the Earth and the sun. UNIVERSITY PARK, Mysteries of one of the most fascinating nearby planetary systems now have been solved, report authors of a scientific paper to be published by the journal Monthly Notices of the Royal Astronomical Society in its early online edition April 22. The study, which presents the first viable model for the planetary system orbiting one the first stars discovered to have planets -- the star named 55 Cancri -- was led by Penn State graduate student Benjamin Nelson in collaboration with faculty at the Center for Exoplanets and Habitable Worlds at Penn State and five astronomers at other institutions in the United States and Germany. Numerous studies since 2002 had failed to determine a plausible model for the masses and orbits of two giant planets located closer to 55 Cancri than Mercury is to our sun. Astronomers had struggled to understand how these massive planets orbiting so close to their star could avoid a catastrophe such as one planet being flung into the star or the two planets colliding with each other. Now, the new study led by Penn State has combined thousands of observations with new statistical and computational techniques to measure the planets' properties more accurately, revealing that their particular masses and orbits are preventing the system from self-destructing anytime soon. In order to perform the new analyses, Nelson and Ford collaborated with computer scientists to develop a tool for simulating planetary systems using graphics cards to accelerate the computations. By combining multiple types of observations, the Penn State astronomers determined that one of the planets in the system (55 Cnc e) has eight times the mass of Earth, twice the distance of Earth's radius and the same density as that of Earth. This planet is far too hot to have liquid water because its surface temperature is estimated to be 3,800 degrees Fahrenheit, so it is not likely to host life. It was only in 2011, eight years after the discovery of this inner-most planet (55 Cnc e) that astronomers recognized it orbited its host star in less than 18 hours, rather than nearly three days, as originally thought. Soon after, astronomers detected the shadow of the planet passing over the Earth, allowing astronomers to measure the size of the planet relative to the size of the star. "This research achievement is an example of the scientific breakthroughs that come from data-intensive multidisciplinary research supported by the Penn State Institute for CyberScience," said Padma Raghavan, distinguished professor of computer science and engineering, associate vice-president for research and director of the Penn State Institute for CyberScience. Penn State professor of astronomy and astrophysics Alexander Wolszczan and his colleague Dale Frail discovered the first planets ever detected outside our solar system. These planets orbit a distant pulsar star and were the first-known super-Earth-mass planets. Recent observations by NASA's Kepler mission demonstrate that super-Earth-size planets are common around sun-like stars. The study led by Nelson is part of a larger effort to develop techniques that will help with the analysis of future observations in the search for Earth-like planets. Penn State astronomers plan to search for Earth-mass planets around other bright nearby stars, using a combination of new observatories and instruments such as the MINERVA project and the Habitable Zone Planet Finder being built at Penn State for the Hobby-Eberly Telescope. "Astronomers are developing state-of-the-art instrumentation for the world's largest telescopes to detect and characterize potentially Earth-like planets. We are pairing those efforts with the development of state-of-the-art computational and statistical tools," Ford said. Nelson will present the results of the new study at a July meeting of the International Astronomical Union in Namur, Belgium. In addition to astronomers at Penn State, the study's co-authors include scientists at the University of Florida, Yale University, the Max-Planck Institute for Astronomy in Germany, the University of Hawaii and the Harvard-Smithsonian Center for Astrophysics. A star map for the constellation Cancer and the 55 Cancri system. The star hosting the 55 Cancri planetary system can be seen with the naked eye from a dark site. For observers in the Northern hemisphere, Cancer is best viewed in the spring. 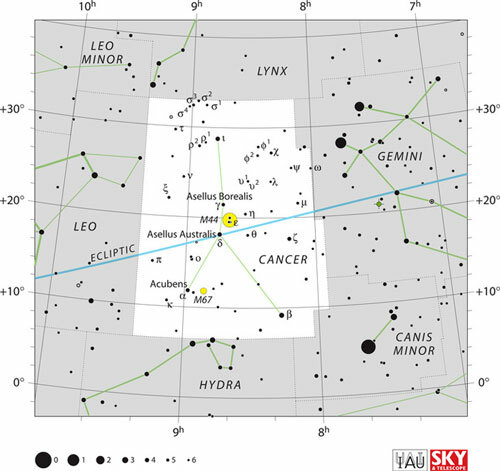 The 55 Cancri planetary system orbits the star labeled rho^1, which is slightly to the left of the top star that is connected by lines in this illustration to show the constellation Cancer. The Center for Exoplanets and Habitable Worlds is supported by Penn State, the Penn State Eberly College of Science and the Pennsylvania Space Grant Consortium. Calculations were performed at the Penn State Research Computing and Cyberinfrastructure unit and at the University of Florida High Performance Computing Center. This research was supported by a NASA Origins of Solar Systems grant (NNX09AB35G) and a NASA Applied Information Systems Research Program grant (NNX09AM41G).